Trolls have always been one of my favourite monsters. They were the first creature I wrote up in my own "heartbreaker" bestiary. I picture them a lot like they are depicted here, except mine are lanky and less chunky. Green warty hides, tall and lanky, big tusks. They live in huge Trollhalls that are tunnelled into hillsides. They are skilled at working iron, often serving as the armorers for nearby humanoid tribes. Trolls are cunning and cruel but are not unreasonable and they enjoy talking to their prey. Adventurers can often stall by simply striking up a conversation, and may even be able to convince the Troll to let them go, if it would benefit the troll. 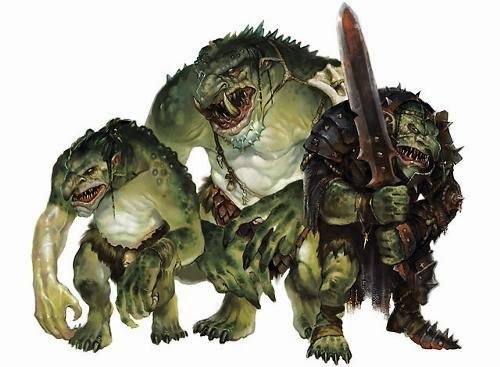 Trolls use huge iron clubs in combat, they strike at a victim's legs and pelvis, trying to cripple their prey. It is said that trolls eat their prey slowly, trying to keep their victims able to speak as long as possible. A large gangly creature with a hoary scaled hide and a mouth full of tusks. Trolls love to eat prey live and thus try to cripple their enemies to consume at their leisure. Trolls are brutal and cruel but they are also fairly intelligent. They will often talk to smaller folk before deciding to eat them and may be convinced to spare travellers if they can offer a good enough reason to do so. Trolls fear flame and will bargain for their lives if they start suffering wounds which do not immediately begin healing. Regeneration:d6 ( At the start of its turn, the troll regains d6 hit points. When it takes acid or fire damage, the troll’s hit point maximum is reduced by the same amount for 24 hours. A troll can be killed if its hit point maximum is reduced to 0 or if it takes acid or fire damage while at 0 hit points or less). Love the post title. Good stuff.